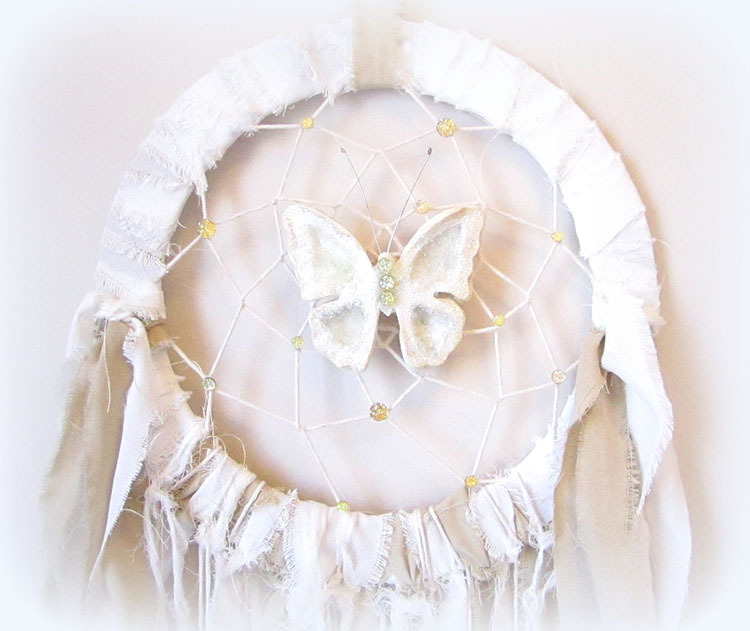 I’ve created this dreamcatcher for my daughter’s bedroom. Its mainly monochromatic as it uses only white and beige tones. I used Prima’s Relics & Artifacts Butterfly and Chandalier pendants as embellishments as I’m entering this project for the International Talent contest on The Relics & Artifacts Tribe Facebook group. The Relics & Artifacts butterfly was embellished using Diamond dust. I glued the dust inside the wings using Gel medium. I added 2-3 layers of it and then sprinkled the wings with Finnabair white fine glitter. Finally I added a few Prima “Say it in crystals” gemstones in the middle of the body and behind on the chord. I also used a little of Empress Gold Color bloom spray to add a little color on the butterfly’s wings. 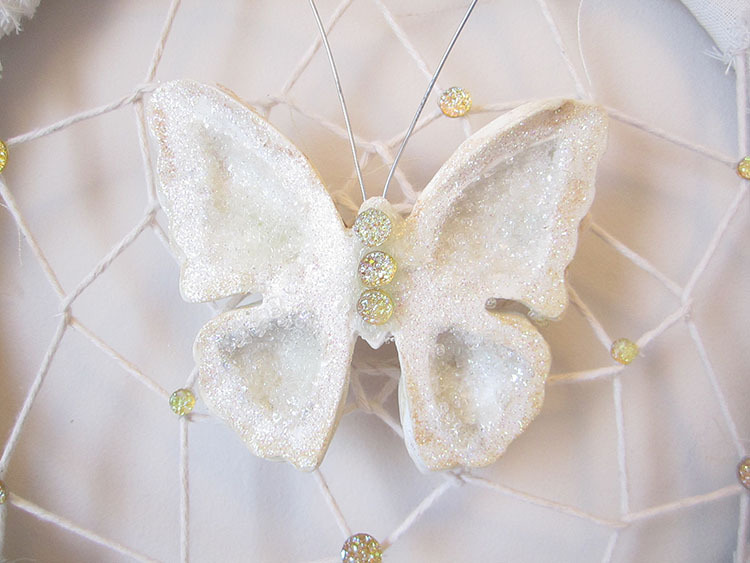 I glued a hook on the back of the butterfly and hooked it onto the dreamcatcher. I secured it using the chord and some more glue so it stays in place. 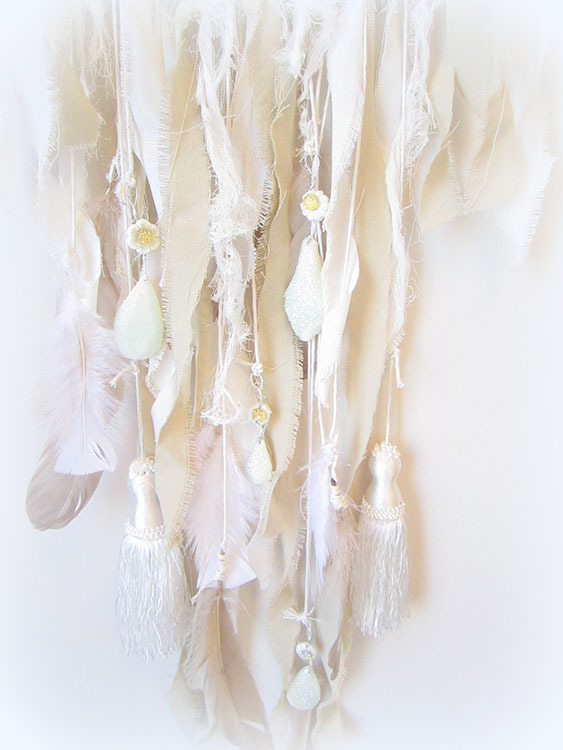 I used Butcher Chord to create the Dreamcatcher and also used it to tie the hanging embellishments to the ring. The ring, ribbon, and tassels I found at Michaels. I added some feathers and cheese cloth from my stash. 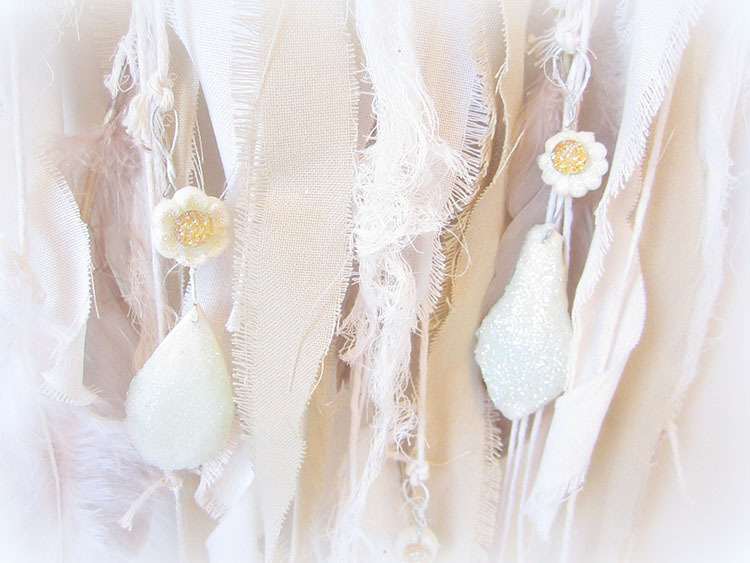 The chandelier pendants were covered first with glass bead gel, then with white glitter and finally with one Prima Say it in crystals gemstone. The chandelier pendants, feathers and tassels were tied to the Butcher chord.